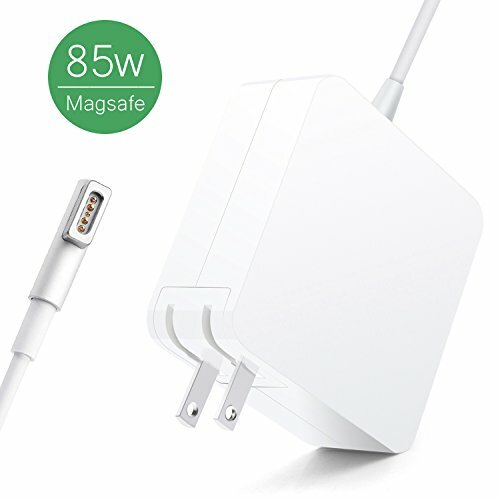 1 x Kakivan 85W Magsafe 1 L-Tip Power Adapter. Kakivan provide our fan-favorite one years warranty to this MacBook Pro Charger. If you cannot confirm whether this charger suits for your MacBook or not, please feel free to contact with us for help. Thank you! QUALITY ASSURANCE: Kakivan MacBook Pro Battery Charger was certificated with UL, CE, ROHS standard. Intelligent output and protection, avoid sparks, overheat, overcurrent. 100% Meet the American's Safety Standards. Mac Laptop Charger CABLE MAGSAFE 1 L-Tip: The improved MAGSAFE connector is more durable. No only has all the features of the original connecter and it has a stronger wire. When the connection is secure, an LED located at the head of the DC connector lights up; an amber light lets you know that your notebook is charging, while a green light tells you that you have a full charged. INPUT: Mac Pro Charger 100-240V,1.5A 50-60Hz Output: DC 18.5V-4.6A. If you have any questions about this product by Kakivan, contact us by completing and submitting the form below. If you are looking for a specif part number, please include it with your message.